Smiling is a universal sign of happiness, however, some adults feel as if they are not comfortable with their smile and would rather hide behind a smirk. However, now more than ever, adult braces have become more of a “norm” in today’s society. 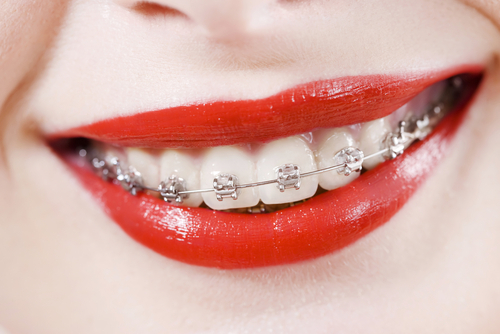 We get it, the thought of having metal braces as an adult could be uncomfortable or embarrassing for some, as they may be an eye-sore. Although, over time, the world of orthodontics has made wearing braces and fixing your teeth as an adult a whole lot easier (and comfortable). According to the American Association of Orthodontics, a 2014 study shows that adults make up about 1.5 million orthodontic patients, a record high, in the U.S. and Canada. Fixing your teeth for aesthetic or health related purposes is now possible without having to deal with distracting metal brackets on your teeth. Clear/Tooth Colored Braces– These type of braces are more subtle and tend to be less of a focal point, however, these type of ceramic braces can stain the teeth and tend to appear tinged yellow over time. Invisalign or Clear Aligners– Think of these as removal braces or retainers. The patient has the option to remove the aligners while they eat or brush their teeth. They are extremely unnoticeable however they can be a bit of a nuisance if you are a frequent snacker or coffee drinker. These can also stain very easily if they are not properly cleaned. Lingual Braces– Braces of this type are placed on the inside of the mouth, behind the teeth, making them virtually invisible. Correcting your teeth, in retrospect, does not take a very long time, varying from case to case, however, some adults are simply uncomfortable with the thought of having metal-mouth for a year or so. When you’re in that mind-set, a year and a half can feel like forever. Adults who seek a perfect smile now have access to options when it comes to fixing their teeth. No more distracting metal braces on your smile.